The first time you record a video, you are prompted to select an audio input device. Our recommendation is to use a USB microphone, if possible, for best results. Note that you should connect the audio device before starting a Jing video. Remember, just because you select a device, it doesn't mean you have to record audio. You can always click the Mute button to disable audio recording. Jing will prompt you if an audio device you were using is no longer available. If you connect a new audio device to your computer, you will have to select it in Jing. Next, under Audio Input, click Select Device. Jing will present available audio devices. Choose the one you wish to use, and click OK. Tip: If you don't see a device you think should be in there, try investigating the audio settings in your Control Panel (Windows) or System Preferences (Mac). Does Jing record audio with video? Absolutely. If your microphone isn't working, something's wrong. Maybe your mute button is on? If you're not being muted, the next thing to check is your audio input volume level. Maybe it is too low. 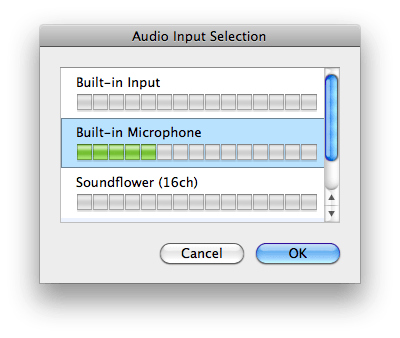 Check your Control Panel (Windows) or System Preferences (Mac) and see if you need to adjust the volume level. Why is my audio quality so poor? The likely culprit is your microphone. There is a big difference between using a built-in microphone versus a dedicated microphone. As a general rule, USB microphones are better, and you'll want to keep it away from your computer fan and other white noise if possible. Can I record my system audio? Jing can usually record system audio. Why the italics? Well, especially with Windows Vista there are a lot of "if's" and conditions based on your sound card and more. Keep in mind though--for both Windows and Mac, Jing was not really designed to capture system audio. We focused on voice capture and keeping the audio files small. We should also make clear that you can't switch back and forth between microphone and system audio once you start recording. While this article was written for Camtasia Studio, the content is extremely applicable to "fixing" your microphone setup and recording system audio.